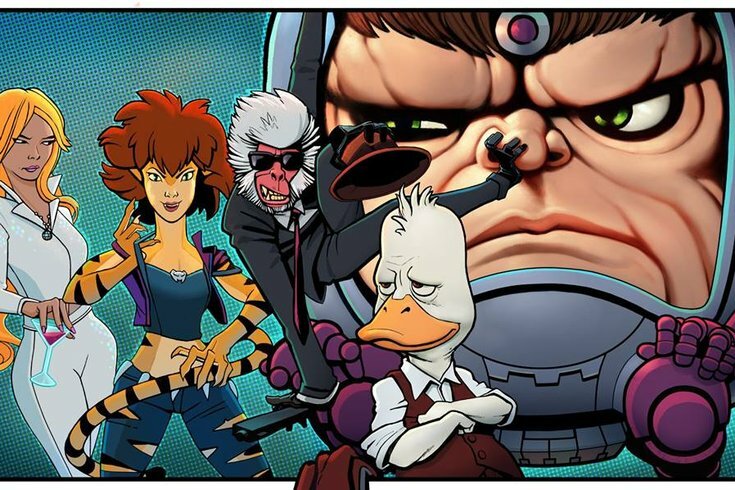 Marvel animated series for "Howard the Duck," "Hit-Monkey," "M.O.D.O.K," and "Tigra and Dazzler" are coming to Hulu. “Howard the Duck,” a talking duck from outer space, may be the most notable character out of the four series announced, especially after that weird movie with Lea Thompson from 1986. (Seriously, can we talk about how Thompson's character tried to seduce a duck? Why?) Hopefully animation will take away the original weirdness from the movie. Howard, voiced by Seth Green, also makes an appearance in "Guardians of the Galaxy" and "Guardians of the Galaxy Vol. 2." "M.O.D.O.K" is written by Jordan Blum (“Community”) and Emmy-winning comedian Patton Oswalt. The show follows an egomaniacal supervillian whose head is really big and his body is really little (per the description from Hulu.) He struggles in trying to control his evil organization as well as his family. “Tigra & Dazzler” which is written by Erica Rivinoja (“Girls Trip”) and comedian and talk show host, Chelsea Handler, follows two “woke superheroes” who want recognition from the millions of people in Los Angeles.